World of Warcraft Communities: Could you (eventually) create your own realm? The meaning of a Realm in World of Warcraft has become incredibly blurred. It’s no longer a distinct cluster of servers, or even a static circle of characters.Over time, patches and expansions have added cross realm LFG tools, shared cities and a sharded open world. Battle for Azeroth will even change how PvP servers work, giving players the freedom to toggle which version of Azeroth they’d like to adventure in. If anything, the choice of where you create your character is having less meaning with every update. But is there a way for players to take advantage of this ‘tearing-down’ of old realm restrictions? 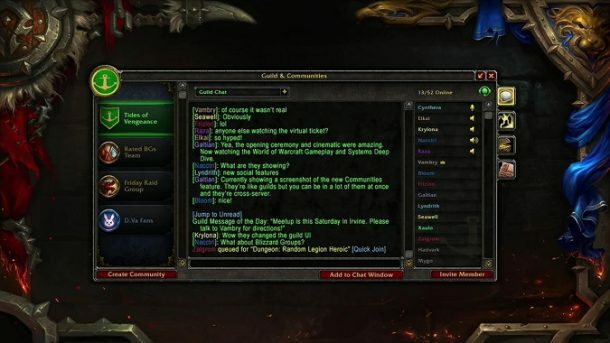 Depending on how it’s implemented and how it evolves, World of Warcraft’s upcoming Communities feature might be just the thing. To recap, communities would function as permanent cross-Realm groups. They sound a little similar to Guilds, with less functionality but wider reach. Both are restricted to the same faction but, while Guilds get storage and a snazzy tabard, Communities get that wider reach. Both have a chat channel and simple management structure to handle invites and organisation, and both would have access to a unique chat channel and shared calendar. Here’s the bonus: while you can only join a single guild per character, there doesn’t seem to be any such restriction for Communities. I’ve seen similar concepts in other MMOs; WildStar has Circles, while Guild Wars 2 simply lets you join multiple Guilds. They’ve been great for building little pocket communities, but (especially in the former’s case) struggle due to a lack of in-game advertising. This should be a little easier in WoW’s version with the addition of a ‘quick-join’ feature. Even so, it’s an idea with huge potential, especially if Blizzard choose to push the concept further. Imagine a Community Browser filled with adverts for those listed publicly, complete with details on who to contact and how to join. Beyond that, how about tilting LFG or LFR to team you up with people from your communities? What about spawning you alongside your community members when you’re in cities or out adventuring? How about enabling guilds to affiliate themselves with communities that share interests? Would a Community feel like being part of a mega-Guild, or would it almost be like a mini-Realm? As Scott Andrews over at BlizzardWatch mentions, I don’t think that Communities will replace Guilds, either in the short or long term. Guilds are there for your core interest – raiding, PvP, etc, while Communities would work beyond that. What I do think will happen is the rapid replacement of custom channels (e.g. the classic LookingForRP) with more organised structures. Yes, there are shades of Hotel California in all of this. But, if I’m honest, I also have a desire to get back to the feeling of Vanilla WoW. When we had a small crowd on our realms and no cross-realm grouping, a reputation mattered. Being a good community member had benefits beyond the guild you were a part of, from running dungeons to crafting items. Could the addition of Communities go some way to recreating this sense of belonging? Just like with World of Warcraft Classic, the success of Communities will all depend on the implementation. Would it be worth it, to re-establish communities within the World of Warcraft and reduce the reliance on anonymous LFG/LFD tools? Personally, I feel that it is, but I’d love to know your thoughts as well, so please sound off in the comments. This entry was posted on Wednesday, November 8th, 2017 at 8:37 pm	and is filed under MMO Musings, Warcraft. You can follow any responses to this entry through the RSS 2.0 feed. Both comments and pings are currently closed. 2 Responses to WoW Communities: Create Your Own Realm? I agree. This could be a huge boon to those smaller guild clusters and roleplay alliances. Can’t wait for it to land – possibly before the next expansion too!